Undoubtedly the most important member of Osborn's Avengers, The Sentry was the ace-in-the-hole that kept Osborn's enemies at bay. During Norman's initial meeting with his Cabal, he threatened them to fall in line because he had The Sentry on a leash. The group then accepted Osborn's pact. 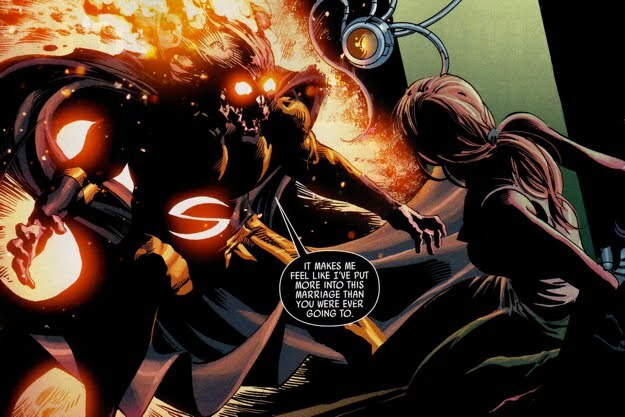 The details surrounding Norman's initial meeting with The Sentry are unknown, its likely that Norman requested a meeting with The Sentry to discuss the post-Skrull Invasion world. Osborn was at the pinnacle of his career at that point, he was a war hero so The Sentry may have even admired Osborn then. The two would find that they had some key things in common. After Norman finished recruiting his team and things began to settle, Norman reached out to The Sentry and offered him some help. More specifically, emotional help. The Sentry found himself in a constant state of angst as he struggled to suppress the darker side of his personality, The Void. 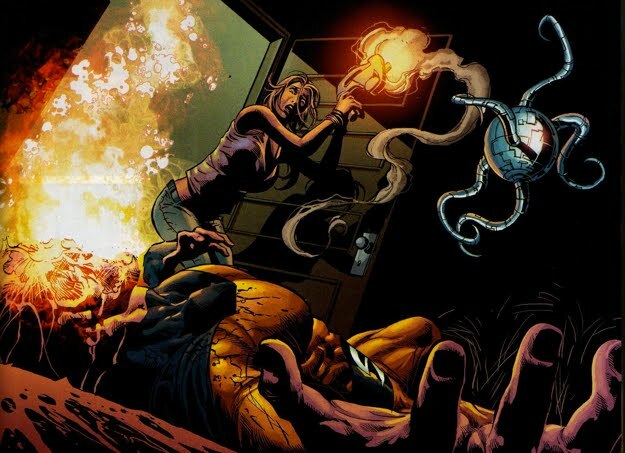 Norman used his own villainous past as inspiration for The Sentry, claiming that he had conquered his demons and so could The Sentry. Norman told the young hero that he could control The Void, he just 'has to choose to' control him. He then encouraged The Sentry to embrace his human side, indulge in the joys of being human, he should eat, drink, shave, and shower. Osborn convinced The Sentry that his problems were 'chemical' (due to the nature of the origin of his powers) and thus easily solved. Norman reinforced the idea that The Void never existed Then Osborn did something The Sentry did not expect at all, he provided him with more of the serum that gave him his powers. The serum was created by a man named The Professor, and Bob Reynolds (a drug addict) broke into his lab and imbibed The Professor's serum. The Sentry was created that fateful day. Immediately after taking the serum, The Sentry embraced The Void portion of his persona. The Void, grateful that Osborn 'freed' him from within Reynold's psyche, told Osborn that he owed him a favor. Thus, the Osborn's secret weapon was born. The timeline for this event is a little sketchy, but it most likely occurred a few days after Norman moved into Avengers Tower alongside The Sentry and Ares. The event is described as having taken place 'days ago' relative to the events of Dark Avengers #3. From that point on, The Sentry served as Norman's personal bodyguard and his humanized H-Bomb. But The Sentry's weak mental state often caused him to be a liability for Osborn at times. The Sentry's past would return to haunt him one more time and ultimately lead to his demise. But not his past that most were aware of, rather, his real past the truth that only he and his wife Lindy were aware of. In Dark Avengers #9, Lindy, seemingly fed up with everything her husband has done, blasts him point blank in the face with Noh-Varr's Kree blaster. It appeared as though she had killed her husband. 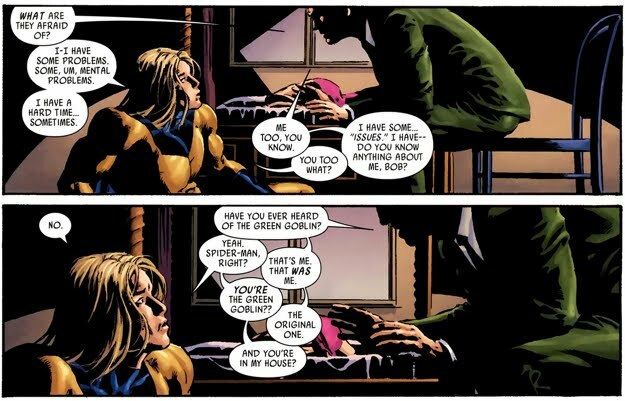 But, as seen in Dark Avengers #13, the story did not end there and as her husband laid dead on the floor next to her, Lindy explained the truth behind the origin of The Sentry. She confessed that the story of a young boy finding The Professor's secret Serum and subsequently transforming into the super-powered Sentry was not true at all. In actuality, Robert Reynolds was a junky looking to score a quick fix in The Professor's lab and in the process he stumbled upon the Serum. 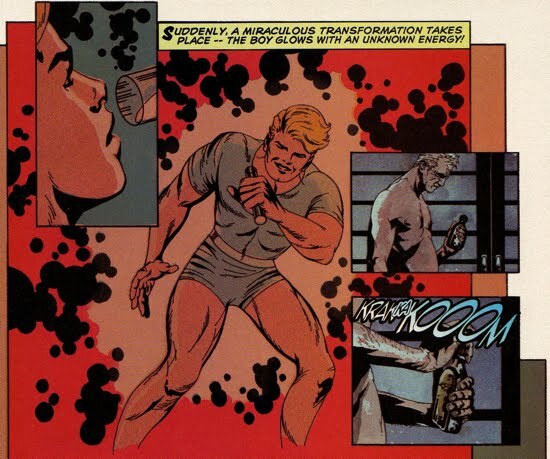 Robert Reynold's addiction went from narcotics to power, as he struggled to feed is obsession and forced The Professor to produce more of the serum. She described The Sentry as 'what happens when a person who doesn't deserve the power, gets the power'. Suddenly, The Sentry rises from the floor and attacks his wife, its clear that The Void had now taken control over Reynolds' body. Lindy does not want to fight him and she pleads for him to just kill her, The Void accepted her offer. But an internal struggle for control over The Sentry arose as Robert struggled to stop The Void from killing Lindy. Reynolds won out as The Sentry blasted out of Avengers Tower and into outer space. He flies all the way to sun in an attempt to kill himself but The Void prevented him from doing so. The Void then tried to reason with Reynolds, claiming that the only time he accomplished anything was when The Void was in control. It appeared as though Reynolds considered letting The Void take the helm. Norman Osborn and the rest of his team were completely unaware that all of this had transpired (despite the fact that Lindy recorded her story using one of the Avengers Tower servant robots) and had seen The Sentry (of apparent healthy mind) at the beginning of Dark Avengers #10 just before their battle with the Molecule Man. 1. The Sentry stopped The Punisher's assassination attempt on Norman's life, he fired a high powered Skrull rifle from a safe distance. The Sentry plucked the bullet from the sky then confronted The Punisher. Summarized here. 2. The Sentry served as Norman's muscle while Osborn negotiated with the duplicitous Agents of Atlas. Summarized here. 3. The She-Hulk (aka Jennifer Walters) even tested The Sentry's might as she battled Osborn's ace while trying to defend the new She-Hulk, Lyra. Summarized here. 4. 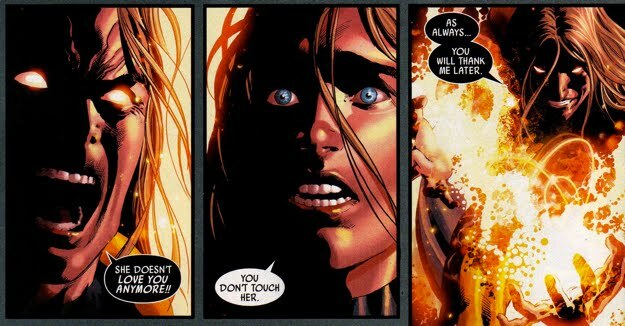 The Void proved to be a huge liability as Emma Frost and Scott Summers accessed this weak point, causing Osborn's retreat from the island Utopia. Summarized here. 5. The Sentry was bested, a rare occurrence, by the Young Avengers who used an enchanted chain to launch The Sentry into another dimension. Summarized here. 6. After allowing the Void to take control, The Sentry slaughtered a huge number of Atlanteans upon Osborn's command. Norman wanted to demonstrate the strength of his regime to the Atlantean terrorists. 7. When Marc Spector arrived back in New York City after faking his death, Osborn sent The Sentry to bring him into custody. Summarized here. 8. Noh-Varr, a former member of Osborn's Avengers, went off-radar after realizing the extent of the madness that comprised his fellow Avengers. The Sentry was sent by Norman to bring him back. Summarized here. The Sentry met his fate on numerous occasions during his time as Osborn's secret weapon, but somehow he managed to continually come back from the dead every time. Below is a list of his 'death's. 1. 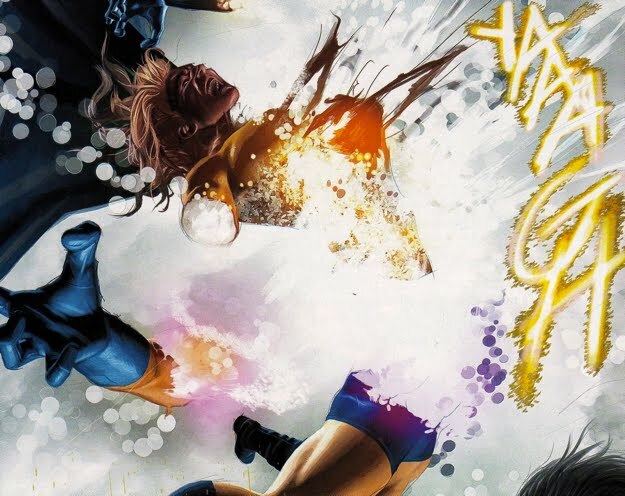 The Sentry was killed by Morgana Le Fay in Dark Avengers #2. 4. The Molecule Man pulled a repeat performance killing The Sentry a second time in Dark Avengers #11, after claiming that the two 'could have been friends'. 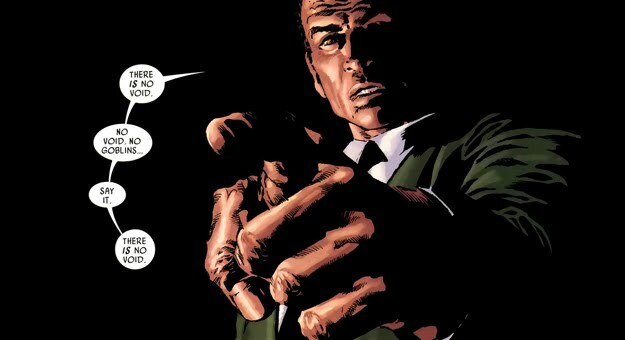 The eventual demise of Norman Osborn was directly related to the series of events that led to The Sentry's breakdown as well. Those events are detailed here.